I am standing at the Men-an-Tol sacred site near Penzance in Cornwall with my husband and three young sons. Women and their partners and children are arriving at the site and are welcomed to stand in circle with me around the holed stone in the centre. The men are invited to hold and protect our circle around the circumference and the children play and come in and out of the centre as I begin our ceremony. In my journeying I have seen how our pre-Celtic ancestors, the indigenous people of Briton would have been a part of this land. I am holding ceremony at the four sacred sites which I believe would have been used to mark the four female rites of passage during her life span. These ceremonies are held at the solstices and equinoxes to mark the transition between each of the outer seasons of the Earth. Only threads and strands remain in folklore about the use of these sites that I played at when I was a child. Here at Men-an-Tol I envision that our ancestors would have made a pilgrimage here with their daughters from all over West Penwith at her Menarche. her first rite of passage, initiating her into womanhood. Her mother and perhaps her grandmother too would have set out on the journey to this sacred site and along the days, perhaps weeks of walking they would have told her what they knew of the women’s mysteries. Explaining to her that the two poles or currents of energy that run through her female body influence her cyclical nature as a woman. The via positiva, masculine pole or line of energy which Hamish Miller author and dowser here in Cornwall has named this the Michael line of energy or known in China as the Great Male Dragon is symbolised by the standing stone to the north of the holed stone here at Men-an-Tol. The via negativa, feminine pole or line of energy – Mary line or Great female Dragon is symbolised by the standing stone to the south of the holed stone here at Men-an-Tol. So at menarche a girl was instructed in the ways that these two great shifting currents of energy that were running through her body affected and influenced her during each menstrual cycle. Each month she would experience the rising of energy of the masculine pole – the via positiva in the first half of her cycle – her inner Spring and Summer. Building her identity and her outer place in the world. She would then experience the shift in her cycle to the via negativa or feminine pole in the second half of her cycle – her inner Autumn and Winter. Each month being called back by the now falling or drawing in energy to her Self again. Back home to listen at each bleed to the Earth energies moving through her enabling her to receive her own inner guidance. Always at the centre of these two currents rests her deep and Holy Self as represented by the holed stone at the centre of the Men-an-Tol site. 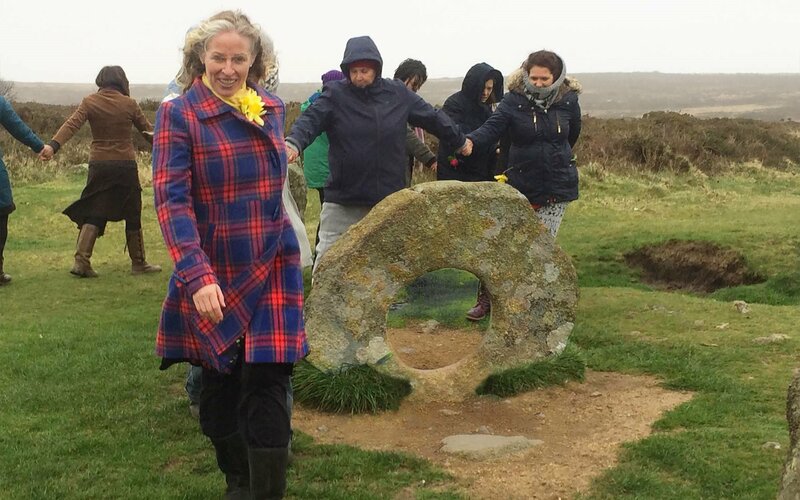 The women at Men-an-Tol at the Spring Equinox call themselves present by name, where their land is, the day of their cycle and the life arc that they represent. Each states what it is that they need to bring balance to in their lives as we shift now from the feminine arc of autumn and winter to the rising energies of the masculine arc of spring and summer. We join hands and sing then weave a lemniscape through the two poles and round stone of the Men-an-Tol thirteen times to represent the thirteen moons of each year. Coming back to a wide circle surrounding the site closing words are spoken and the women present close the ceremony with words of encouragement. The circle is open but forever unbroken. lovely to connect, despite the weather..